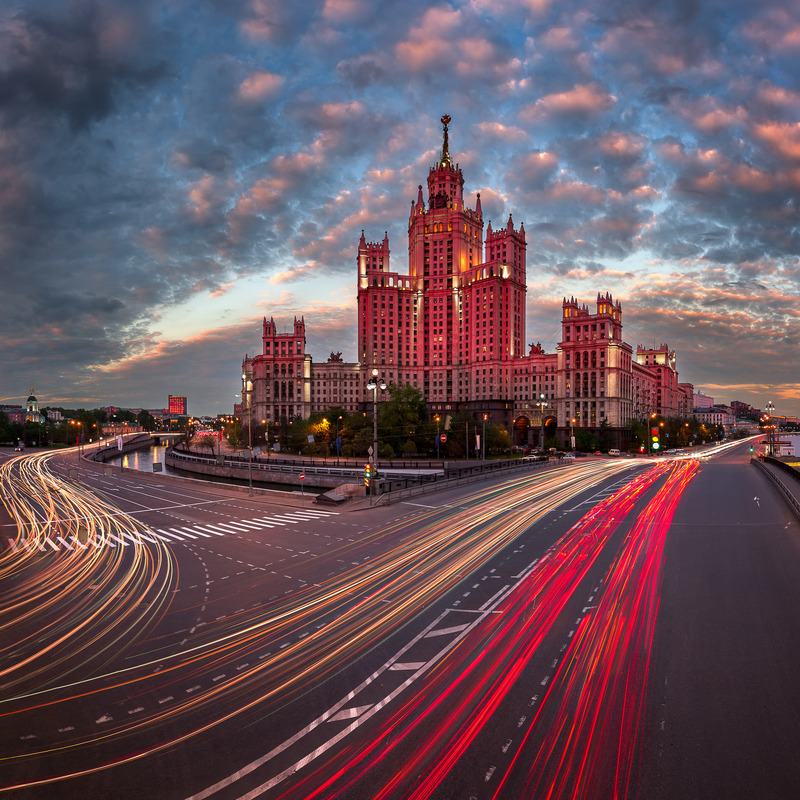 The Seven Sisters are a group of seven skyscrapers in Moscow designed in the Stalinist style. I cannot imagine Moscow cityscape without these buildings – it is like Paris cityscape without Eiffel Tower or London Cityscape without Palace of Westminster. I love all of Seven Sisters, but Kotelnicheskaya Embankment Building is my favourite one. It is located on Kotelnicheskaya Embankment, where Jauza flows into the Moscow River and it dominates entire neighborhood. I chose sunset time to capture this building in the best possible light. This photo is a composite image from 3 captures – the main image was captured when the sunset highlighted the building with infernal red glow, the sky was captured 15 minutes before and the city lights was captured 15 minutes after. Also I used additional captures for traffic trails. Panorama from 4 horizontal images in 2 rows, additional exposures for highlights and car trails, focal length 16mm, aperture f/8, shutter speed 4 seconds, ISO 100, 3-stop ND filter, tripod, pano head. This entry was posted in City and tagged Moscow, Russia.